Got annual leave coming up and can’t stop dreaming of bottomless beverages and endless buffets? On your next holiday, enjoy travel the way it was meant to be: worry-free and fun-filled. 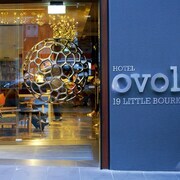 Put away your wallet (and responsibility in general) with all-inclusive Melbourne hotels from lastminute.com.au. You can enjoy gourmet grub, entertainment, liquid refreshment and more without having to make it rain. Stop running up separate tabs for drinks, food and fun—you’ll have just one bill to worry about with Melbourne all-inclusive accommodation. From brekkie to your evening (or early morning) nightcap, many hotels include beverages, food and even tips, so your brain will be free to think about more important things (hey, naps and activities are key!). Whether you want to get out and explore or just chill out by the pool until the nightlife heats up, these hotels offer the total package. Plus, as we all know, when everything is included, there are no bad decisions. Chase your drinks—and your dreams—with all-inclusive hotels in Melbourne from lastminute.com.au. Take a girls’ getaway or surprise your special someone with a romantic escape (they won’t even know you forgot your anniversary). You can always live in the lap of luxury thanks to our exclusive deals and discounts. Switch up the status quo and get out of that office chair—after you book your escape on lastminute.com.au, of course. Then all you have to do is dream of colourful tiny umbrellas in your endless pina coladas.